One of the keynote speakers at Inman Connect this week is the CEO of Yelp.com, Jeremy Stoppelman. Yelp.com, like real estate sites, publishes local property information. But rather than for sale properties, Yelp focuses on businesses. How can a company with a fraction of the employees, a fraction of the budget, and a much shorter history, manage to trounce companies with decades of experience building local business directories? If I had to pick just two reasons, I’d go with 1. Better SEO, and even more importantly, 2. Community contributed content. On the SEO side, one easily measurable factor is pages indexed by Google. If you run a command for “site:yelp.com” (without the quotes on Google, Google currently returns 1-10 of 10,400,000 results, which means Google can see 10.4 million pages on yelp.com. If each page of Yelp’s site received only one visitor per month from Google, they’d generate a ton of traffic. 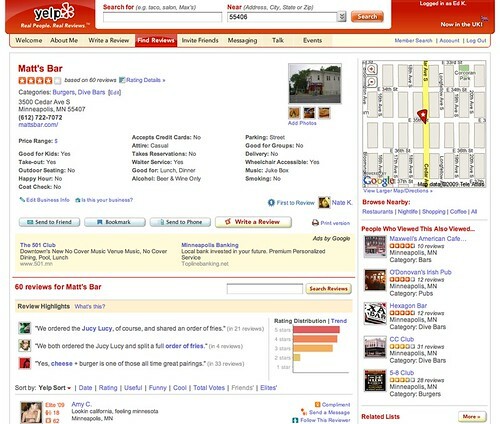 Compare that to Yellowbook.com (3.1 million) or DexKnows.com (2.9 million) and you can see one of Yelp’s SEO advantages. While you may find some of that information on a yellow pages website, you’ll rarely find all of it presented as well as Yelp does. – Community editing of business information. – Claiming businesses by business owners so they can keep the information up to date themselves. – Links to nearby businesses. – Links to other businesses in the same category. – Lists of other businesses Yelp users viewed in addition to the one you’ve currently viewing. – Ratings of the reviews. – The ability to contact reviewers. – The ability to follow reviewers you like. – Lists of businesses that include the business you’re viewing. While SEO matters a lot, and having accurate objective data about businesses is valuable, Yelp’s community created content is the key differentiator that has allowed it to generate additional consumer-friendly information at nearly no cost. Take a step back and think about what type of information your website provides. Does it resemble Yelp or the yellow pages? Who are the Yelps of the real estate industry? To date, the Yelps of real estate have been sites started by real estate outsiders such as Trulia and Zillow. They are both great at SEO, but more importantly, they’re enhancing property listings with help from home owners, buyers, and real estate industry professionals who contribute information to their websites for free. In fact, real estate agents often pay Trulia and Zillow a monthly fee for the privilege of updating more content (aka. going “Pro”). Yellow pages companies and large real estate franchises continue to buy TV advertising to promote their websites. When was the last time you saw a TV spot for Yelp, Trulia, or Zillow? Yellow pages and real estate companies continue to rely solely on professionals for content creation while Yelp, Trulia, and Zillow have opened up the door to anyone with a nugget of local knowledge. Yellow pages and real estate companies continue to hold back data – YP, by charging businesses for enhance listings and real estate by trying to force people to call for more information – while Yelp, Trulia, and Zillow continue to provide more and more information to consumers for free. The trends seem clear and have already been proven in other industries such as online retail (Amazon vs. Barnes & Noble), automotive (edmunds.com vs gm.com), and auctions (Ebay vs Sotheby’s). Consumers are turning to the web for easy access to information. Fight or embrace that trend. This is an interesting article; thank you Ed for posting it. As a real estate professional in San Francisco, you may find it surprising to know that a Yelp advertising sales agent referred me to this article during a sales call this morning. I whole heartedly agree that Yelp is superior to Yellow Book and DexKnows. Critically, though, neither are real estate oriented sites, but rather generic “phone books.” Your observations about them is important and explains their stagnate web growth. Yelp vs. typical real estate sites (like Trulia and Zillow) is a very different comparison. First, let me say that I do love Yelp. You can find my personal profile page at jasonSF.yelp.com or my business profile page by searching Yelp for Jason Allen-Rouman. You’ll see on my personal page that I have one friend and a couple of reviews and on my business page I have a few client reviews. When on Yelp as a consumer, I tend to look for restaurant reviews. As a professional, I rarely remember to prompt clients for a review. In the end, I am, shamefully, a user of the data and not so much of a contributor. Based on 40,000,000 hits nationwide over 30-days, (statistic cited by the Yelp rep during our call), I’d say I am soundly in the majority and Yelp is probably better for it, as 40,000,000 reviews every month would be overwhelming. My experience is common, however. If it strikes my fancy to go out for dinner, I check Yelp. If I need a new doctor, I might check Yelp. Both of those are driven by a desire to obtain a specific service. In real estate, people who want to SELL a house are looking for a service and MAY check Yelp first. However, people looking to BUY a house are looking for a product (a house) and start on real estate specific sites like Trulia and Zillow. Buyers are no doubt retaining real estate professionals in a service capacity, but that understanding comes second to the house hunt. More often than not, Buyers start their property search online and select an agent through a number of on- and off-line gateways. These include Yelp reviews, Yelp ads, Trulia and Zillow listings, the individual agent’s website, brokerage sites, word of mouth from trusted friends/family, or other social networks like Facebook or LinkedIn, etc. Often this research VALIDATES the decision to go with a specific person, but there is no data that demonstrates that it drives it. Although Sellers are clearer about needing real estate services and therefore begin their foray into selling their property by looking for an agent, it remains unanswered how many select their agent based on any one source of information and, specifically, if something like a Yelp ad is superior to an ordinary Yelp review page. This holds true for “upgraded” Trulia pages (Trulia’s version of advertizing). Unlike retail sites, like Amazon, there is no purchase tracking, which underscores another difference in buying a home: it is not a retail experience even though it is presented as one with the burgeoning Trulias and Zillows of the internet. There is absolutely no question that online advertising is the present and the future. The question remains what is the best form of it. So far, my Yelp rep can’t point to a compelling reason to upgrade from the basic presence on the site. Jason, I love your comment. I think you have seriously spent sometime on this question and want to say thank you for your contribution to this topic. Ed, very good article and love the fact that you have pointed out that Yelp.com is the new yellow pages. I think there may be a difference between yelp.com and trulia (etc) that would be great to have a specific article on. Like Jason said, Yelp.com is a validator of the service provided by an agent/company (the real estate industry being a service industry), Zillow and Trulia are places that consumers look to obtain a product. That being said, Yelp.com in the real estate industry is for branding (tells the quality of service of past experiences), Trulia/zillow are for originating. My company, just recently got on yelp and the feedback alone has been helpful. Now the decision to advertise is the question. Perhaps a bit of both what I will call “originating advertising” and “branding advertising” would be the best recipe.